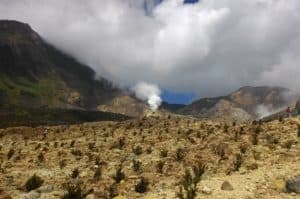 Some of them are an active volcano that still erupts from time to time and makes it dangerous to go hiking. But some other are not anymore, and the residue of old eruption makes either beautiful waterfalls or green cover all over the mountains. This makes them look very easy in the eyes and many of them now become vacation spots. You can either go hiking or camping there. You have to choose the right time to visit Bromo. If you go hiking in summer, of course, the sunrise view can be easily enjoyed without the possibility of raining or even cloudy sky. But the downside is the savanna’s sight won’t be as good since the grass gets dried in the summer and it’s the opposite if you visit them in the rainy season. So it depends on what you prefer to enjoy the most from the trip to Bromo. Semeru is another famous and, actually, the highest mountain in Java Island. 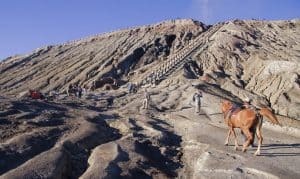 It is located in the area of Bromo Tengger National Park. 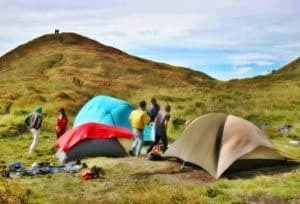 The summit, called Mahameru, heights 3.676 meters above sea level and it considered as a pride to be able to reach the summit of Semeru Mountain in Indonesia. The temperature at Mahameru can reach 4-10 Celsius degree. If you summit this mountain, you could see a view like none other, which basically is a sea of mountains. White clouds covering the top of other mountains nearby is like a wave of the ocean and the thread of those mountains are the peak of that wave. Those other mountains are Sindoro, Slamet, and Sumbing, which are some of the highest mountains in Central Java. This one is one of the “easiest” mountains to climb in Indonesia. Why do we say that? Because even novice can accomplish the summit. Of course having said that, doesn’t mean you can go hiking without preparations, you still need to arrange a good deal pre-hiking stuff. Located in Garut, West Java, Papandayan’s height reaches 2.665 meters above sea level. 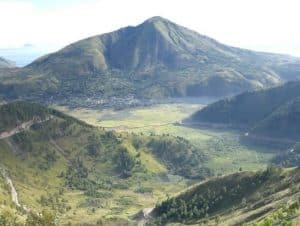 The last time this mountain erupted was on 2002.And because Papandayan is an active volcano, it has some active craters with sulfur gas comes out of them. North Sumatera has some active volcanoes, but Pusuk Buhit is the most famous one. The beautiful pine forest makes great panorama around this mountain. The green hills that surround Pusuk Buhit are actually residues of Ancient Toba Volcano’s activities. From Pusuk Buhit’s summit, heights 1.972 meters above sea level, you can enjoy both sunset and sunrise. Have you actually ever seen that flower from that famous song “Edelweiss?” You are on the right track if you actually plan to go hiking to Pusuk Buhit because you can find this rare flower in Indonesia. Here, said, is the last place Edelweiss grows in North Sumatera. You can also find this flower in Semeru, Central Java, but if you’re in North Sumatera and want to hike, why not? This is one of the most famous mountains in history. In 1815, around 90.000 people died because of the giant eruption of this mountain. 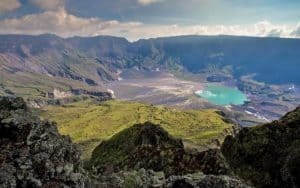 Before the massive eruption, Tambora was towering to 4.300 meters above sea level, made it one of the highest mountains in Indonesia. 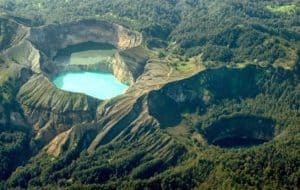 It also becomes one of the most beautiful vacation spots in Indonesia since the eruption site now grows much beautiful and exotic vegetation as well as becomes a habitat for faunas. There is tropical rain forest and on 1.200 meters above sea level dominated by savanna and forest pine. The eruption also made a huge 7-kilometer-wide and 1-kilometer-deep caldera. You can visit this mountain if you want to feel the historical event that did not only change environment but also affected some historical and transportation in Europe. The track to this lake now is different than to its summit, but since this site gains a lot more attention than the actual summit, it’s worth mention here. The track to the lake is pretty accessible, only 30-minute-long, and anyone that is fit enough can easily do it. It can be pretty cold in Ende (Flores Island, East Nusa Tenggara), so make sure you wear extra coat or jacket. If you want to get the view of the sunrise, you should get on with the trip very early in the morning and bring any kind of lightning since it is pretty dark at the site and you don’t want to stumble and hurt yourself because of some rocks and spoil the trip. This also makes total sense. We should not disturb any fauna in any mountain, forest, or any other sets of place. But old people believe that these animals, specifically in the mountains, can guide climbers to the right places when they’re on route. Some believe that these animals are incarnations of some gods that local folks have faith in. Either way, disturbing them is definitely not a good idea. Whatever the reason is. We hope you enjoy these facts of hiking in Indonesia. 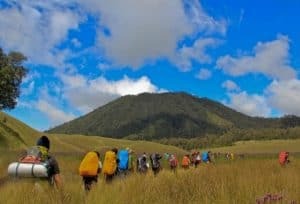 We hope these five myths don’t discourage you from going hiking or even planning on hiking in Indonesia. Indonegeolosians love myths, that is also a fact. This beautiful country has many things to offer and you can take advantage of it for your pleasure, as many have done.